Welcome back to your regularly scheduled coverage of California wine country. In the world of higher education, August typically means staff training and welcoming all of the first year students back. For me, that means 4 weeks of 12-14 hour days without a single day off. That is why I am so excited for Labor Day Weekend. In Sonoma County, Labor Day not only means barbecues, picnics, and your last chance to wear white. It also means it is Sonoma Wine Country Weekend. This grand event is a chance to celebrate the summer with all of your favorite Sonoma wineries. With events taking place on all weekend, Sonoma Wine Country Weekend will be the perfect way for Katie and I to celebrate the end of August and get us back into enjoying what we love most about this area....good vino! Giving everyone just enough to keep them coming back for more, Friday begins with intimate lunches and dinners with winemakers from around the region. These delectable meals take place at the winery where you have the chance to sit down and break bread with the winemaker and other key players who bottle some of your favorite wines. Each meal is prepared by local participating chefs and are expertly paired with wine. Getting started on Saturday, MacMurry Ranch in Healdsburg, CA plays host to the 31st annual Taste of Sonoma. A collection of over 150 wineries and 60 local chefs, this event provides an opportunity for wine lovers and foodies alike to drink and dine on some of the best that Sonoma County has to offer. However, this isn’t just a vendor fair where you move from one booth to the next. Other programs offered include a chef competition, intentional food/wine pairing experiences, and the Sommelier Stars Wine Tours where you can be led through a series of tastings by some of the nation’s most acclaimed sommeliers. If you haven’t had enough food and wine yet, you have another opportunity to dine with a winemaker for dinner. After experiencing Taste of Sonoma, Katie and I will be going down the road to enjoy a five course, farm-to-table meal with Quivira Wines, a leader in biodynamic and organic wine producing. 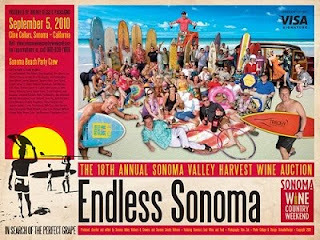 Rounding out the weekend is the 18th annual Sonoma Valley Harvest Wine Auction. Hosted at Cline Cellars, wine auction is sure to bring the spirit of wine country as people bid often and bid high a variety of lots, including specialty bottles, weekend excursions, and plenty more! Wine auction serves as your last chance to get up close and personal with winemakers as they serve as the hosts of each table. Tickets are still available for all of these events but are going fast. Also, if you happen to have a Visa Signature card, you may be eligible for a number of discounts and benefits. Katie and I will be covering many aspects of this great weekend and will be sure to document our experiences, right here on The Oregon Wine Blog.